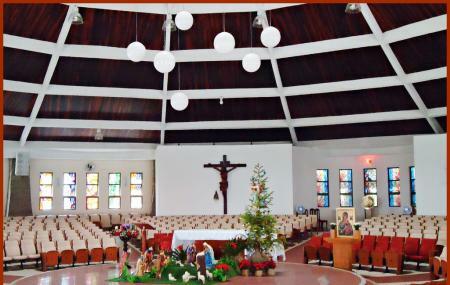 Igreja de Santa Ines is a prominent church in Balneario Camboriu. The design of the church is rather interesting with a circular seating area and a central podium where the services take place. If you are looking for a spiritual place with a beautiful, minimalistic design head to the church to admire the architecture, the layout or simply offer a little prayer while in Balneário Camboriu. Attending a mass here is not uncommon for locals and tourists alike. Thursday: 5.00 pm - Mass. 7.00 pm - Mass and devotion to Saint Frei Galvão on the last Thursday of each month with the anointing and the delivery of pills. How popular is Igreja De Santa Ines? People normally club together Amores Beach and Mirante De Taquarinhas while planning their visit to Igreja De Santa Ines. Muito bom o atendimento já compro no angelone desde que foi inaugurado na quarta av. Gosto deste supermercado tudo que quer encontro lá. E tab faço a 4 anos os cursos do Angelone da loja 9. Maravilhosos curso. E sempre comprarei neste supermercado. ! A igreja é muito bem planejada pois recebe muitos veranistas. A missa das 10h de domingo é para crianças mas interessante demais!! !